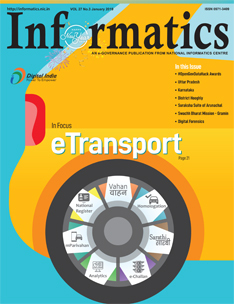 Informatics is an E-Governance Bulletin of National Informatics Centre (NIC) and is being published every quarter since 1992. The Bulletin covers news and features about the e-governance activities being carried out by the various Units of NIC situated in all the States and Union Territories of India. The print version of the bulletin is currently being subscribed by and the subscription is limited to the Ministries, Departments, Organisations, Institutions and Libraries under the purview of the Government of India, as well as the Embassies and Consulates of India all over the world and the High Commissions/Embassies of various countries in New Delhi. 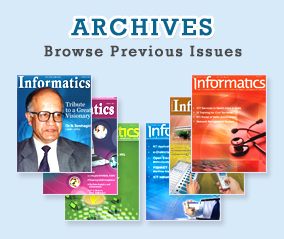 Please write to us at editor[dot]info[at]nic.in for all your queries related to subscription. You may subscribe to our e-newsletter by filling up the form below.